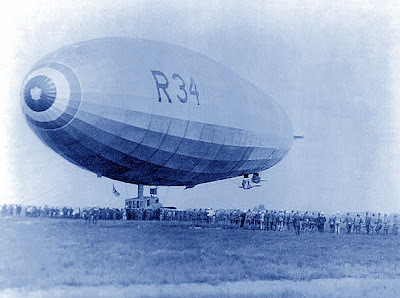 That was the headline on 6 July, 1919, after the British R34 airship - a craft twice the length of a soccer pitch - successfully completed a 108-hour flight to land safely on Long Island, US. The R34 was a military machine, built to carry more than two tonnes of bombs. Despite its size there was little room for passengers in the control cabin, so hammocks were slung in the walkway which ran inside the airship’s envelope. Cooking hadn’t been a design priority, and meals were heated using the hot exhaust pipe from one of R34’s five engines. With all engines running flat-out, the R34 could manage barely 100 km/h (62 mph), which meant that strong headwinds could easily reduce over-the-ground speed to little more than a fast run, making the Atlantic run a big achievement for the massive craft. And after a turnround of just four days, the R34 successfully headed out across the Atlantic again back to Britain, this time with favourable winds that reduced the crossing time to just 75 hours. 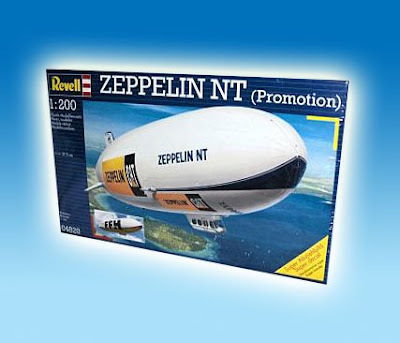 In the model world, there are no R34s available that we know of, but you can find some Zeppelin kits, including a promotional 1:200 scale Zeppelin NT. This is the helium-filled design based at Lake Constance, home of the present-day Zeppelin company. And airship enthusiast John Dziadecki maintains a current listings page that’s packed with all the info you might need. You can find a (tiny!) R34 Long Island landing movie here, a Zeppelin NT at eBay here, and John Dziadecki’s listing page here.